Q: How long will it take for someone to follow your feed or RT (re-tweet) your comments in approval? A: Not long at all. But what may surprise you is that your new fan may be Republican United States Representative for North Carolina's 10th District, Patrick McHenry. The images embedded here are screenshots taken by MagicH on his own PC, to show you how the time- and date-stamps appeared to him as he looked at his email and at the tweets he'd sent. I'm also linking those three tweets here, so you can see their time- and date-stamps on the Twitter site. If you click the links, the timestamps on Twitter, as you see them, will adjust for your timezone, so that may create the mistaken impression that the tweets themselves do not chronologically accord with MagicH's email timestamp. However, MagicH is a resident of Perth Australia, so adjusting your timezone for the discrepancy (and also Standard v. Daylight Savings, where applicable) should make the stamps line up so that the last tweet predates the email notification by a minute — i.e. exactly as it happened. A major component of the Democrats' energy legislation and the Democrats' answer to our energy crisis is, hold on, wait one minute, wait one minute, it is promoting the use of the bicycle. Oh, I cannot make this stuff up. Yes, the American people have heard this. Their answer to our fuel crisis, the crisis at the pumps, is: ride a bike. Democrats believe that using taxpayer funds in this bill to the tune of $1 million a year should be devoted to the principle of: "Save energy, ride a bike." Some might argue that depending on bicycles to solve our energy crisis is naive, perhaps ridiculous. Some might even say Congress should use this energy legislation to create new energy, bring new nuclear power plants on line, use clean coal technology, energy exploration, but no, no. They want to tell the American people, stop driving, ride a bike. This is absolutely amazing. Of course, saying that riding bikes is a dumb solution to reducing energy dependency when you could otherwise pump millions into nuclear plants and clean coal is like saying that Americans' jogging to lose weight is foolish when we could invest untold millions into liposuction and the development of a Photoshop slimming tool that works—only in real life this time. McHenry's got other problems. He dismissed a soldier, who inconvenienced his going to the gym while in Baghdad's Green Zone, as a "two-bit security guard." The callousness of his attitude toward someone who was acting in the interest of his safety was emphasized by a subsequent attack on the Green Zone. Even worse for McHenry: he filmed the aftermath, pointing out where landmarks were struck by fire, showing specific evidence of the location of destruction, then posted it online — perhaps to indicate his bravado in being around at the time while bad things happened in the best-defended citadel in Iraq. This possibly jeopardized Green Zone operational security (OpSec) and prompted the Pentagon to, basically, yell at him and make him take the video down. We will lose on legislation. But we will win the message war every day, and every week, until November 2010. Our goal is to bring down approval numbers for Pelosi and for House Democrats. That will take repetition. This is a marathon, not a sprint. In short, John McCain, whose policies were not substantially distinguishable from those of the previous eight years, was not conservative enough for McHenry's America. His leadership was such that No True Republican could want it. Good Republican leadership, on the other hand, consists of abandoning governance or the creation of cohesive policy in favor of relentless yelling about people we don't like, in hopes that 2010 will be the year American government can finally get back to the business of yelling about people we don't like. He's also been implicated in questionable electoral and PAC funding activities. Last but not least, he seems willing to court "Birther" interest by waffling on President Obama's citizenship in the standard "I'm just asking questions, here" format, then backtracking tepidly when called on it. His willingness to say, "I have absolutely no reason to question President Obama's citizenship," comes only after the qualifier, "As I stated last night, I have not carefully reviewed the evidence as a jurist would." This splits hairs nicely. It gets out the instant and galvanizing message that he's willing to entertain the idea that Obama is not a citizen, while walking it back with language that concedes that he won't question Obama's citizenship yet... since he's not some fancypants judge. Put in blunter terms: "I'm no expert. I'll just assume he's a citizen for now. But there's always the possibility that some totally brilliant legal mind with a wealth of juridical expertise behind it will somehow see through all the really obvious evidence that he's a citizen to some truth underneath. Maybe. I really wouldn't know. Just talking, here!" Why? Why would a United States Representative follow someone on Twitter who said horrible things like this? Only a few explanations come to mind. 1. This isn't Patrick McHenry's Twitter account. Extremely unlikely. One, the content reflects things he is doing at the moment, directing people to interact with him live. Two, the feed repeatedly links back to his own House.Gov page, a site which would be tracking incoming content and would have notified even the dumbest intern of the existence of the Twitter feed. Three, no one spoofs a public personality on Twitter to behave exactly like the personality except for one easily overlooked discrepancy. There's absolutely no point to it. Anyone doing it for kicks would be trying to get kicks, not mask them. Four, even if his staffers were the dumbest people on earth, at some point in the last seven months, someone would have pointed out a Twitter account they didn't know about. There's really no point in entertaining this explanation. 2. Patrick McHenry has a Twitter bot that automatically follows people. A bot is just a bit of programming that automates an online function. In this case, a Twitter "follow bot" will scan Twitter for keyword usages you favor and automatically add anyone who tweets them. Say you run a golf shop and have an in-house pro who's willing to give lessons on the cheap. You might program a follow bot for your shop's Twitter account to automatically follow anyone looking for the terms "golf pro" "discount" and whatever your location is. Simple explanation, right? But that doesn't make any sense given the evidence. One, McHenry's Twitter feed goes back to April 14th (conspicuously, the day before tax day and thus a day before the first tea party protests), and yet he only follows 1,200+ people. Even assuming he'd set up a follow bot a month ago, he'd be following over 3,000 people by now, because Twitter allows you to follow up to 100 new people per day. That number would doubtless be higher by word of mouth. Even with one month of a functional bot, McHenry should be following well over 3,000 more people. Most tellingly, though, since following MagicH on Friday, McHenry has only gone on to follow 28 more people, the last one, as of this writing, being a djtablesauce. Even over a span of three days, there's no way that whatever keywords McHenry chose could have targeted MagicH's tweets without targeting hundreds of conservative Twitter users who are also using those keywords, often within organized topics that would have garnered McHenry's attention. Those organized topics are represented by those # marks. By tweeting to things like #tcot — "Top Conservatives on Twitter" — McHenry has directed his comments to those following the #tcot topic. Since he's targeted that audience with his tweets, any follow bot created would likely be targeted to that audience as well. Yet, despite MagicH targeting that audience too (although satirically), McHenry's Twitter account has followed so few people from it since. Those not familiar with Twitter might not realize that #tcot surges at all hours with incredible volume, like Gulf storm surge colliding with a flooded Mississippi — often with the same negative consequences for black people. Tweets emerge and disappear off the page nearly instantaneously. Anyone who tweets at that audience and looks for keywords from that audience would have their "followers" column overwhelmed in short order. In conclusion, given the numerical evidence, it's extremely implausible that McHenry followed MagicH due to some automated process. 3. A page or intern manages Patrick McHenry's Twitter account, and he's not involved with it. It's possible, but also unlikely and immaterial. As to that last point, if a staffer is managing this account, he or she is doing so at McHenry's behest. He or she ostensibly has his confidence and trust to act in accordance with The Plan or The Message. Just as a captain is responsible for the crew under him, if McHenry's staffers are making judgment calls or tweeting out mission statements, they're doing so under the aegis of McHenry himself, whether he's directly ordered it or is tacitly in control. As a member of the soi-disant Party of Personal Responsibility, McHenry has no other attitude or approach to take to this situation; either way, it's on him. This is the chain of responsibility when you establish the leadership paradigm as a fundamental tenet of your party's (and your own) qualifications. Now, as to the first point, it's unlikely that McHenry is uninvolved. He's young! He's still at that age where technology adoption is easy. And if McCain can tweet, so can he. Also, he's not unsavvy when it comes to messaging. While he might not execute that messaging well, he certainly knows which avenues to attempt. For instance, he may not pack in the townhalls 100%, but he's smart enough to put himself out there to not only conduct them but be able to say that he conducts them. Speaking of which, take this tweet from a day before he followed MagicH on Twitter: "Send online healthcare townhall questions via @/DM or email (mchenrytownhall@gmail.com) and I'll answer them live tomorrow at 11am." The tweet asks people to engage him via Twitter's Direct Message (DM) function, demonstrating awareness of the site's functionality. Even if staffers mined the Twitter feed and the email address for questions, it's implausible to suggest he wasn't aware of where the questions could be coming from. Finally — and, unfortunately the stream of this townhall is no longer available for viewing — it would have done him a world of good to visibly check and respond to his Blackberry or iPhone on camera, to show supporters the value of connecting with him via texts, because it would show connectivity, folksiness, personability, all those good things. 4. Patrick McHenry manages his own Twitter account. If he didn't, why only 305 tweets since April 14th, 2009? There are easily a half dozen events or talking points per day that staffers could exploit, either reiterating talking-points memos or giving conservative boilerplate responses to what's on the TV. Even at, let's say, five tweets per day, between April 15th and November 6th, that's 1,030 tweets that should be there. If you're having your staff run things, that many tweets is a no-brainer. First, you don't have to write them yourself. Second, it gets your message and "brand" out on every incident or issue of the day. Third, it gives other conservatives on Twitter incentive to follow you: you're going to be dropping sick politi-beats on them, like, every single day. They will want to listen to you. But, if you're a busy congressman tweeting on your own, 305 tweets over 206 days sounds about right. You have something to say once or twice per day, or else you have something to say once per day and also pass on a link you find convincing or enlightening. A tweet pace of 1.4 per day is just about perfectly within the wheelhouse of someone who's trying to maintain a Web2.0 brand without having the time or attention to really exploit its functionality. Someone like a sitting congressman. So what conclusions can we draw from this? What has happened here? First, it's highly unlikely that this is an outlaw or parody Twitter feed. It would be easily noticeable to borderline-competent staff; and even if it weren't, someone would have told them about it in the last seven months. 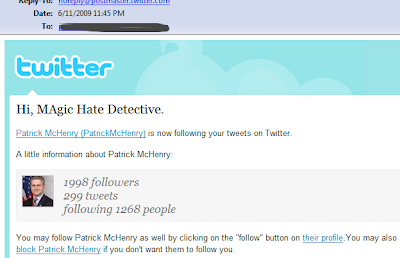 Second, the number of people McHenry follows simply does not accord with bot usage. He should be following thousands more people, even if he's looking for the most histrionic and unpleasant keywords associated with the far-right, if he's got any automated process at work. The fact is that conservative discussion on Twitter is large and intense enough to garner even 3,000 hits in a month's time, whatever the word choice. Third, even if McHenry has farmed out Twitter responsibilities to his staff, the interactivity of his public appearances and the words used on his Twitter indicate his awareness of that content outlet. And even on the extremely tenuous chance that he knows nothing of what his Twitter account does, he is still accountable for it. It's his name, his staff, his brand, his mandate. You cannot lead while disclaiming the actions of those you directly lead, those for whom you bear direct responsibility. But the idea of staff responsibility rings a bit hollow. A dedicated staff or staffer would exploit an interactive function like Twitter more than 1.4 times per day. Tasked with getting McHenry's message or brand out, they'd suffer no shortage of things to talk about, respond to, link, or just "re-tweet." The slow and intermittent activity it exhibits is more indicative of a single man in charge. And who is that man? He's a man who's fond of self-promotion and found (although not yet judged) ethically questionable. He's a man who was willing to look at 2001-2009 and this nation's governance, then look at John McCain's allegiance to most of the same and deem him insufficiently conservative. He's a man who's been willing to equivocate about Barack Obama's citizenship and then backtrack without contradicting himself or condemning the thinking he's echoed. He's also mocked incentivizing the use of bicycles as a means of reducing oil dependency. He is, in short, someone so hard-right, so unscrupulous and, frankly, so dumb as to see a bunch of tweets about how "Obama needs to be impeached" and is "the real perpetrator" because he forced Nidal Hasan "to sacrifice himself to destroy America" and "the Constitution" nod silently at them and think "right on" and then follow the person who wrote them. He is exactly the sort of person — and, via Twitter, he is likely exactly the person — who unironically and uncritically applauds such virulently racist, eliminationist and dangerous language. Nidal Hasan acted on Obama's orders; Obama's mission is to try to destroy America. win the message war every day, and every week, until November 2010... to bring down approval numbers for Pelosi and for House Democrats. That will take repetition. This is a marathon, not a sprint. Perhaps the last, most distant and improbable excuse McHenry could employ is that he followed MagicH for the sake of satire. But that would require hundreds of the other people he followed to be tweeting satirically about the same racist, eliminationist, paranoid and verbally violent things. Given the facts, that explanation doesn't hold water. And even without those facts, to borrow an instrument that obviously inspires confusion and horror in McHenry: conservatives tend to use satire about as well as a fish uses a bicycle.